C. P. Cavafy (1863–1933) is now probably the best known of all modern Greek poets, but his work was hardly known in Greece until after his death. He was born in Alexandria, Egypt, and with the exception of a few years spent in England and Constantinople as a child, he lived in Alexandria for the rest of his life, dying there in 1933. During his lifetime his work had only been published in small booklets and broadsheets or small magazines in Alexandria, and his only recognition in mainland Greece came in a favourable review of these in 1903. It wasn’t until 1935 that a collection of his work, Poi?mata [Poems], was published in Athens. Cavafy is not a nature poet, but a poet of humanity, whose poems revolve around a few predominant themes: meditations on his own life; love poems; the place of man in history; and the subtle interconnections of life with the adumbrations of mythology. This selection covers a range of all these themes, including what are probably his two most famous poems, The God Abandons Antony and Waiting for the Barbarians. The Splendour of a Morning is a project which almost literally fell into our laps. Paul Razzell, past editor of Parenthesis in North America and proprietor of the far too short-lived Inferno Press, had chosen some years ago to publish a manuscript of thirty-seven of Cavafy’s poem in translations by a friend, David Smulders. Smulders had been living and working in Greece some years before, and having become fascinated with Cavafy’s poems he had translated some of his favourites for his own pleasure. Paul approached us to ask about possible illustrators for his edition, and we recommended Peter Lazarov, who subsequently provided Paul with five engravings. Unfortunately Paul’s increasingly busy life continued to hamper his every attempt to get the book into production. He had designed the book by the time he decided, most regretfully, that he would have to close his press, at which point he offered the project to us. We accepted gratefully. Paul’s plan was to publish the translations in a slim book with Peter’s engravings, a plan we were happy to embrace. However, at about this time a friend and subscriber to the press who was aware of our desire to add some commercially unavailable types to our collection offered to fund the striking of new matrices for two faces from the Monotype Corporation in England. One of these—a type we had hankered after for many years—was Jan van Krimpen’s Antigone, a Greek face of great beauty. Consequently we redesigned the book, and we are introducing our new Antigone in this selection of Cavafy’s poems, which is published in Greek with the English translations en face set in van Krimpen’s Van Dijck. We were most fortunate to receive Anthony Hirst’s permission to use his Greek edition of Cavafy’s poems, first published in 2007 by Oxford; more than that, Mr Hirst generously offered to proofread the Greek texts for us. Peter Lazarov’s five engravings are printed from the wood. David Smulders, the translator, has at our request provided an Introduction and one further translation (‘Ithaka’). The Cavafy is exquisite... Beautiful type, beautiful paper, beautiful presswork, fascinating engravings, lovely binding. I’m sure Van Krimpen would have found something to complain of, but I can’t think what it would be. The deluxe copy of The Splendour of a Morning arrived earlier today and, predictably, it is simply wonderful. There is an understated elegance in your work that lets the type, letterpress printing, and wonderful wood-engravings speak for themselves. This book fills a distinct void in the private press world, the only fine press edition with a generous and representative collection of Cavafy’s poetry. 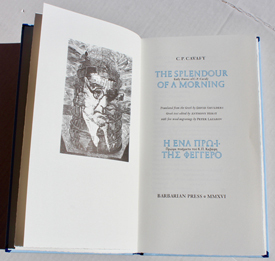 The Splendour of a Morning: Early Poems of C. P. Cavafy is published in an edition of 100 copies for sale, comprising 50 Deluxe and 50 Regular states, with 10 copies hors commerce. DELUXE STATE: 50 COPIES. The texts are printed in hand-set Antigone (Greek) and Van Dijck with Open Kapitalen for display, in blue and black on Zerkall Book White mouldmade paper, with five engravings by Peter Lazarov printed from the wood. The book has a split-board binding with a blue morocco spine and gold-stamped leather label, and paper over boards printed on the upper cover. Contained in a blue silk-covered slipcase with a folder containing strikes of the five engravings. REGULAR STATE: 50 COPIES. As the Deluxe state, but with a split-board binding with blue silk spine and printed paper label. Not slipcased. 5 additional copies of each state, designated hors commerce, are reserved for the use of the press. Both states are bound by Alanna Simenson at Mad Hatter Bookbinding, Sooke, B.C.